Terrace Times, Feb. 6, 1960. 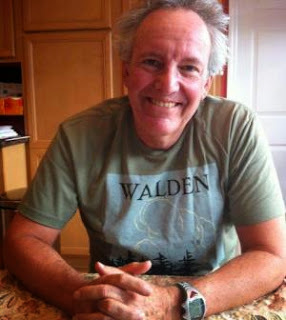 In the 1950s when Jeff Klinkenberg was growing up on N.E. 110th Terrace in Miami Shores, he thought one day he might like to be a baseball player. Or Davy Crockett, or an astronomer or a priest. None of those panned out. Instead he became a newsman because that's what they called journalists back then. He got an early start by putting out a chatty, hand-printed sheet called the "Terrace Times." 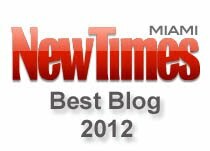 Miami Shores was his beat. In high school he wrote a column for the high school paper called "Klinky's Corner." Later he edited his college newspaper, eventually landing a job at the Miami News where sportswriter Al Levine saw some talent in the lad and took him under his wing. 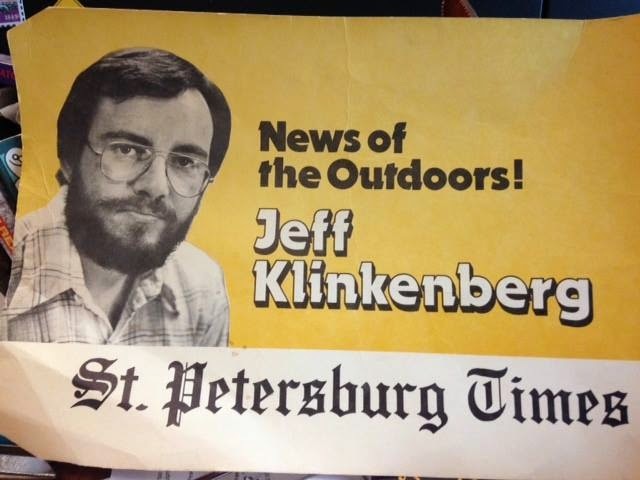 Klink - as he's now known by his friends - covered high school sports and the outdoors for the afternoon paper. At the Times Klink was assigned a familiar beat: Outdoors Florida. But in 1986 he began writing about Florida. And for much of the past 28 years he's traveled virtually every Florida back road seeking out people who are the heart and soul of what he calls the "Real Florida." "You're looking at the ad that ran when I started at the Times in 1977. As you know, these are tough days for newspapers, including the Times, so I accepted a buyout today. My last day as a full-timer will be Oct. 10. I'm 65, I'm on Medicare, I've got money in the bank and I'm married to the astonishing Susan King. So I'm going to do okay. If business arrangements can be worked out, I'll continue to write some Real Florida essays for the paper. If things don't work out, I'll be freelancing elsewhere. In the meantime, look on Facebook for further details. It's been a great run -- and I have to tell you this: Nobody has been blessed with so many wonderful colleagues and readers. You've provided the energy for what I've done for so long. I love you." Ben Montgomery, one of Klink's colleagues at the Times, tweeted this: "Heart broken. Jeff Klinkenberg is retiring. Florida won't be the same. The Times won't be the same." Craig Pittman, the Times' environmental writer said this of his colleague: "The Governor should declare him a Great Floridian. He's done more to educate the people in this state about their roots and their culture and their natural surroundings than just about anybody I know." Today I called Klink and we chatted for the better part of a half hour. He told me that even though one part of his career was coming to an end he was grateful to have gotten his foot in the door on "the tail end of the Front Page era," but lately he was beginning to feel like the Florida panther he'd written about so many times: "Like the panther...I've watched my habitat [space in the paper] shrink." I asked Klink what writers or journalists inspired him early on. 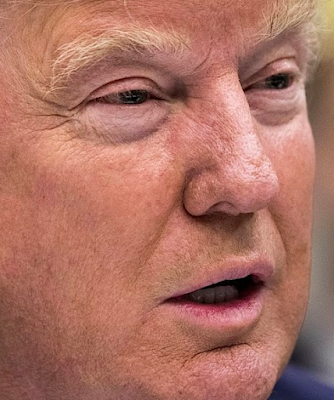 Without hesitation he mentioned four: Eugene Patterson, a Pulitzer Prize winning editor at the Times who went on to become the paper's chairman and chief executive officer, New Yorker magazine writers John McPhee and Joseph Mitchell, and the Miami Herald's Al Burt. 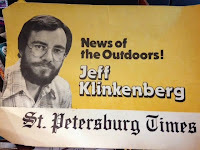 After Burt died in 2008, Klink wrote: "I was a kid sportswriter at the now-out-of-print Miami News when Al began chronicling our state in his weekly column 'Around Florida.' I wanted to be Al Burt when I grew up. "When I started writing about Florida in 1986, I religiously mailed Al my clips hoping for a pat on the head from the old master. He always was encouraging, sometimes about individual stories, but more often about the need for reporters to write about Florida culture as if it were worth writing about. I don't think there are many of us around following Al's lead." 1) The last Martin of Gilchrist County: "A traveling day. Nathan Martin is going to town. He is going to have a meal with the woman he loves. He usually hates wearing a shirt, but Vida will tsk tsk if he shows up with chest bare. He also needs to decide what to do about footwear. He hates shoes even more than he hates wearing a shirt." 2) My dad had an artist's soul, but a temper that left many scars: "A dad can leave another kind of imprint on his kids. When my dad lost his temper, which was seldom, he lost all control. I didn't get spanked; other kids got spanked. He beat me hard enough with a belt to leave welts, bruises and sometimes blood. I have spent years trying to understand the demon that possessed him in those moments." 3) The second coming of Billy the Kid: "Guy on the phone says to "Google 'Billy the Kid' Emerson. He's old now, but he was really famous once. He lives here." So I Google. An African-American piano player born in Tarpon Springs, Emerson ended up at Sun Records in Memphis. Elvis recorded one of his songs. Talk to Billy the Kid, implores the anonymous caller. What a story he must have to tell. In the summer of 2012 I call him. Billy the Kid Emerson says: "I NEVER EVER TALK ABOUT THOSE DAYS" — those days when he played the devil's music and knew Elvis. Now he listens only to spirituals. In fact, he's been writing a suite of religious hymns he calls his masterpiece. I suggest we do an interview at his house. "I'm not looking for glory,'' he says. "But thank you for your interest.'' Click." Klink's last day at the Times is Oct. 10. But something tells me he's not quite ready to give up on the craft he's practiced so masterfully for the past four decades.